Today when my daughter came downstairs for breakfast, she asked excitedly, “Is it Halloween? !” Then, when I told her no, she groaned. I quickly assured her that she had to pick out her costume first, and she quickly got excited again. And now she has a costume… you will be happy to know that chose to be a bumblebee while her brother will be a frog! To them, of course, Halloween will be a time in which they get to dress up and eat candy. And so it should be! But for us older folks, Halloween is a time to indulge in the macabre. And so, for today, I would like to focus on memento mori. So, I decided to download some of his books, since I figured that his writings would be in the public domain! The first work I found? Preparation For Death. You can read here as a PDF, if you’re interested! And, yes, as you might expect, it is a rather macabre, though ultimately worthwhile read. Anyway! Memento mori means in Latin, “Remember death” though it’s usually expanded as, “Remember that you will die.” Basically, it’s the contemplation that all the earthly delights that surround us now will one day pass away, just as we too will one day pass away. And when we die, what will we have left? Will we live in Christ? Or not? And that’s a very serious thought. Honestly, it’s hard not to think about the inevitability of death while you’re there! The bones are real bones from Capuchin monks that have passed away. And, this is just a small part of the actual crypt… there were seriously chandeliers and whatnot made from the bones of Capuchin monks. I was rather thankful that we discovered this place on the day that we were supposed to leave, honestly… otherwise, I may have thought too much about it and been pretty spooked out in the hotel room! 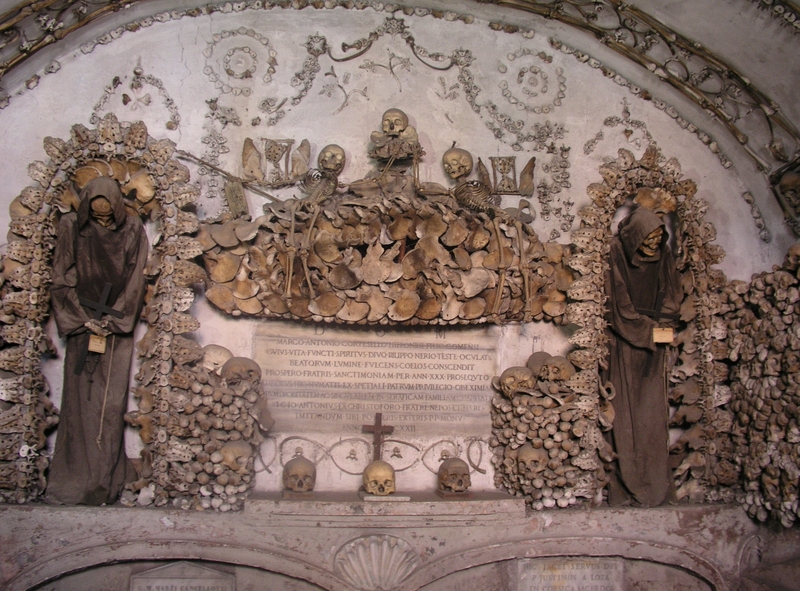 Of course, if Capuchin monks would make such beautiful, yet macabre, art with their bones for the sake of memento mori, it should be no surprise that it is a popular theme that comes up often in religious art! And that reference is often made using a skull. For instance, in this picture of the Great Flood, where the waters are subsiding, there is a skull that can be seen at the very bottom of the picture. So, the artist intends to convey the death of those who perished in the flood, but also seeks to remind us of our own mortality and how quickly it can be swept away. Of course, not all skulls represent this, such as the skull at the foot of the cross, which represents something completely different. Still, the skull is a popular and haunting image that reminds us that we too will die. 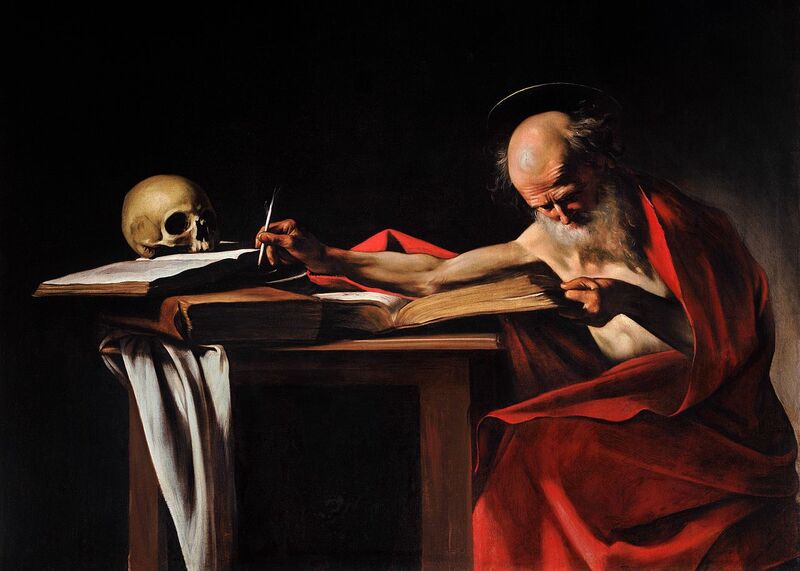 Saint Jerome Writing, by Caravaggio, c. 1605-06. Galleria Borghese, Rome, Italy. St. Jerome is the author of the Latin Vulgate Bible, as well as many other writings. You would think that he, out of all people, wouldn’t be wondering whether he has bore enough good fruits! After all, he is essentially the first person who essentially made the first real effort to standardize and give us the bible that we have today! That’s a fantastic legacy. And yet, here he is, depicted in this art as an old man, scribbling away while a skull is on his desk, reminding him of what is to come. And if a soon-to-be saint is thinking these thoughts, then how much more should we! But the skull is ultimately not an image of despair. After all, in death we will hopefully be united with Christ, and that is worth celebrating! Christ destroyed death, and we have nothing to fear. However, while we are here on this earth, we must keep Christ’s commands and carry our crosses, no matter how hard that can sometimes be. And we need to keep focused on that! So, while we should always keep our hope in Christ, we must remember that we are here to bear the fruits of Christ! After all, everything will pass away. But if we bind ourselves to Christ by obeying His commands, as He directed us to do, then we will live in Christ in paradise. My brother, in this picture of death behold yourself and what you must one day become. “Remember that dust thou art, and unto dust thou shall return.” Consider that in a few years, and perhaps in a few months or days, you will become rottenness and worms. By this thought Job became a saint. I have said to rottenness: Thou art my father: to worms, my mother, and my sister (Job, xvii, 14). All must end; and if, after death, you lose your soul all will be lost for you. Consider yourself already dead, says St. Laurence Justinian, since you know that you must necessarily die (Lign. Vit. De hum. C. 4). If you were already dead, what would you not desire to have done? Now that you have life, reflect that you will one day be among the dead. St. Bonaventure says, that, to guide the vessel safely, the pilot must remain at the helm; and in like manner, to lead a good life, a man should always imagine himself at the hour of death. Says St. Bernard, “Look to the sins of your youth, and be covered with shame”. “Remember the sins of manhood and weep.” “Look to the present disorders of your life; tremble”, and hasten to apply a remedy. When St. Camillus de Lellis saw the graves of the dead, he said within himself: If these return to life, what would they not do for eternal glory ? And what do I do for my soul, who have time? This the Saint said through humility. But my brother, you, perhaps, have reason to fear that you are the fruitless fig-tree of which the Lord said: Behold, for these three years I come seeking fruit on this fig-tree, and I find none (Luke, xiii, 7) You have been in this world for more than three years; what fruit have you produced? Remember, says St. Bernard, that the Lord seeks not only flowers, but fruits; that is, not only good desires and resolutions, but also holy works. Learn then to profit of the time which God in his mercy gives you: do not wait until you desire time to do good, when time shall be no more. Do not wait till you are told, Time shall be no longer; depart; (Apoc., x,6) the time for leaving this world has arrived; what is done, is done. Behold me, O my God! I am that tree which deserved for so many years to hear from Thee, “Cut it down— why cumbereth it the ground?” Yes; for so many years during which I have been in the world, I have brought forth no other fruit than the briers and thorns of sin. But, O Lord! Thou dost not wish that I despair. Thou hast said to all, that he who seeks Thee shall tind Thee. Seek and you shall find? I seek Thee, O my God! and wish for Thy grace. For all the offences I have offered to Thee I am sorry with my whole heart; I would wish to die of sorrow for them. Hitherto I have fled from Thee; but now I prefer Thy friendship to the possession of all the kingdoms of the earth. I will no longer resist Thy invitations. Dost Thou wish me to be all Thine? I give Thee my whole being without reserve. Thou gavest Thyself entirely to me on the Cross. I give myself entirely to Thee. Thou hast said : If you shall ask me anything in my name, that I will do (John, xiv, 14). My Jesus, trusting in this great promise, I ask, in Thy name and through Thy merits, Thy grace and Thy love. Grant that Thy grace and Thy holy love may abound in my soul, in which sin has abounded. I thank Thee for having given me grace to make this petition by inspiring the prayer, Thou showest that Thou dost intend to hear it. Hear me, O my Jesus; give me a great love for Thee; give me a great desire to please Thee, and give me strength to do Thy will. O Mary, my great advocate! do thou also listen to my cry, and pray to Jesus for me.